The Neurofeedback dialog allows to select the data from one or more ROIs as the source of feedback information for a subject during an ongoing measurement. 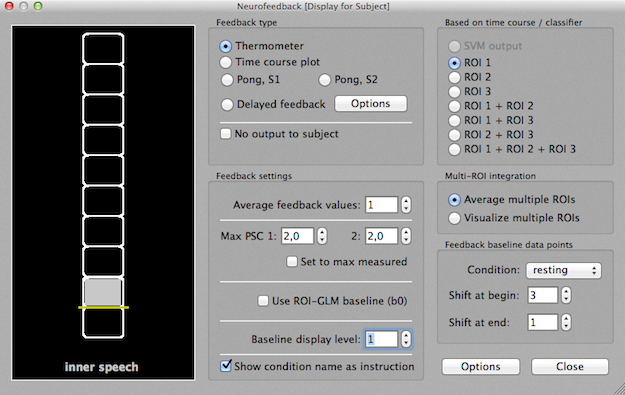 Since TBV 3.2 it is also possible to select the output of a running SVM classifier as a neurofeedback signal. Besides defining the data source for feedback, the dialog also allows to create different visualizations that can be presented to a participant in the scanner for neurofeedback training. The signal from ROI(s) or SVM output can be presented in two major visualization formats to the subject, either as a thermometer display or directly in a time course display (see below). These types can be selected in the Feedback type field by selecting the Thermometer or Time course plot option, respectively (the "Pong" options are for special hyperscanning applications not described here, for details contact support at brainvoyager dot com). The Delayed feedback option allows to calculate a mean feedback signal that can be used for custom feedback displays, i.e. at the end of modulation blocks. The basic neurofeedback calculations can be controlled with the options in the Feedback settings field and the Feedback baseline data points field. For details see the ROI Activation Feedback Calculation topic. Output formats. The content of the plot window on the left side (not the control fields) can be used for neurofeedback presentation: At each volume, its current content is saved as a bitmap (.PNG file) to disk in the neurofeedback target folder specified in the TBV Settings dialog (corresponding as default to the general target (output) folder). In an experiment named "S3_FFA_Feedback", the files incrementally saved in the neurofeedback target folder would be called "S3_FFA_Feedback-1.png", "S3_FFA_Feedback-2.png" for data points (volumes) "1", "2" and so on. These files can be picked up by custom software for final display to the subject. A simple stimulus presentation software, Neurofeedback Presenter, is bundled with TBV allowing to present the generated images to the subject in the scanner. The software needs to be copied to a separate stimulus presentation computer that has access to the TBV neurofeedback target folder. For more advanced feedback visualizations, Brain Innovation also supports (and contributes to) a comprehensive open source presentation software called StimulGL (see Setup for Neurofeedback). In case that the thermometer display is used, feedback can be turned off (i.e. an empty thermometer is visualized) by checking the No output to subject option. 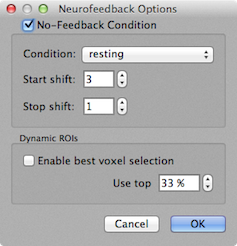 Feedback can also be turned off for a selected condition using the Neurofeedback Options dialog (see below). Besides the image output, the Neurofeedback dialog also saves the current signal values within each ROI to disk in a "ROI Time Points" (.RTP) file. This option can be turned on (default) and off using the Log ROI Time Points File (RTPs) option in the Analysis menu. If enabled a file with the .rtp extension will be stored in the specified feedback folder (FeedbackFolder entry in the Folders tab of the TBV Settings dialog); if, for example, an experiment is named "S3_FFA_Feedback", the files "S3_FFA_Feedback-1.rtp", "S3_FFA_Feedback-2.rtp" and so on will be stored incrementally in the feedback folder, i.e. one file for each time point. Each file contains one line of information containing as the first entry the number of ROIs, then a list of the raw signal values for each ROI and finally a numerical value indicating the protocol condition at that time point. In the case of two ROIs, for example, a typical ".rtp" file would look like this: "2 698.782 685.294 1"; here the first ROI has an average value of 698.782 and the second ROI a value of 685.294 at the respective time point; the last value indicates that at this time point, condition "1" was active. Additional real-time information for custom processing is stored incrementally to disk when turning on the Log ROI Voxel Time Courses (ERT) and/or Log Estimated ROI Betas (BTC) options in the Analysis menu. With these options, however, the respective information is not saved in a sequence of separate volume-by-volume files, but is stored in a single ".ert" or ".brt" file, respectively. Data from each volume is appended incrementally to the respective file during real-time processing. Note that you can also use the plugin interface to access ROI (and other) information for custom feedback processing. Delayed Feedback. 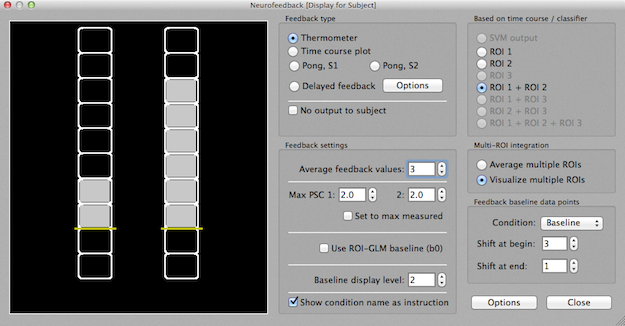 The Neurofeedback dialog allows to provide not only direct (ongoing) feedback but also feedback at the end of blocks. Such "delayed feedback" of the mean level of activity of a whole block may be helpful in the context of some clinical neurofeedback applications, e.g. when the participant in the scanner should solely concentrate on a mental task without being "distracted" by moment-to-moment feedback signals. This feature can be turned on by enabling the Delayed feedback option in the Feedback type field of the Neurofeedback dialog. Click the Options button in this field to invoke the Delayed Feedback Settings dialog (see snapshot above) that can be used to select the protocol condition that should be used for calculating delayed feedback values ("inner speech" in the snapshot above). You may also specify the data points used for calculating the baseline value (Baseline interval) as well as the time points used to calculate the average activation value relative to the baseline level (Modulation interval). 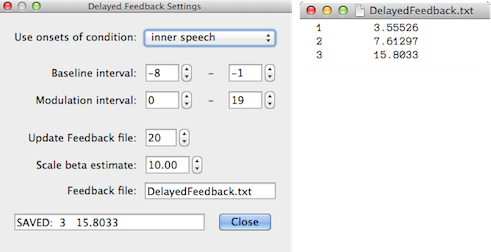 You need also to specify a Feedback file (default name: "DelayedFeedback.txt") that will be used to save the mean feedback values in the feedback target folder; the stored information (see right side in the snapshot above for an example of a saved text file) can be used for providing feedback to the subject using custom software. The Update feedback file value specifies the time point after the onset of the selected feedback condition when the feedback file should be updated writing the newly obtained feedback value to the file; note that the value in the Update feedback file spin box must be larger than the end point of the interval end value of the modulation interval. The Scale beta value spin box can be used to specify a value (default: 10.0) for scaling the estimated percent signal change beta values. The text field on the left side of the Close button shows the last mean feedback value that has been stored to disk. Multiple ROIs. Feedback can be based on the signal from a single open ROI or from the combination (average) from multiple ROIs allowing to combine separately defined regions for combined (averaged) feedback. The combination of ROIs can be performed by selecting the respective option in the Based on time course / classifier field. Options for multiple ROIs are only available if multiple ROIs are defined. In the example used for the snapshot below, two ROIs were defined and thus the options are enabled to select ROI 1 or ROI 2 for feedback as well as the option to use the combined signals, ROI 1 + ROI 2, as the source of neurofeedback. In the case of three ROIs, the respective options to combine two ROIs become available as well as the option to combine all three ROIs. While you can define more than three ROIs and observe the respective time courses in the Time Courses Container, the Neurofeedback dialog will only process the first three ROIs. As default, the Average multiple ROIs option is enabled in the Multi-ROI integration field allowing to combine multiple ROIs for a single neurofeedback display. When turning on the Visualize multiple ROIs option, the data from two regions will be fed back to the subject (see snapshot below). Note that this option only works in case that two ROIs have been defined and the Thermometer display option has been selected as feedback type. The Baseline display level field sets the "zero level" at a vertical position of the bar display. As default, this value is set to "0", which means that the whole display is dedicated only for positive feedback values. If the value is set to "1", the zero level will be between the lowest (first) and second lowest (second) rectangle of the bar, i.e. one rectangle (the lowest one) would be used for showing negative feedback values and the other 9 rectangles would be used to show positive feedback values. If the baseline display level is larger than 0, the zero level is indicated by a yellow horizontal line as shown in the snapshot below for the case of a baseline display level of "2". The Show condition name as instruction option provides a simple way to present a short instruction to the subject to signal the begin of experimental conditions (i.e. neuromodulation blocks vs baseline blocks). The instruction is shown below the thermometer display one time point before the begin of a block (see snapshot at begin of this topic showing the instruction "inner speech"). This provides an easy way to signal the begin (and end) of "rest" and "modulation" blocks to the subject. No-feedback condition. While the No output to subject option is helpful to temporarily turn off feedback to the participant in the scanner during phases of a neurofeedback run, a more systematic approach is to specify a condition as a "no-feedback" condition. This can be done in the Neurofeedback Options dialog (see snapshot below) that can be invoked using the Options button in the lower right corner of the Neurofeedback dialog. To enable the use of a no-feedback condition, check the No-Feedback Condition field. As default, the first condition of a stimulation protocol will be selected as the no-feedback condition. You can use the Condition box to select any other protocol condition. To accommodate the hemodynamic delay, you may also "shift" the intervals of the selected no-feedback condition. Use the Start shift spin box to let the no-feedback condition start later and use the Stop shift spin box to let the no-feedback condition end later. For details on how the default shift values are calculated, see the explanation in the Baseline Identification and Calculation section of the ROI Activation Feedback Calculation topic.